1 For Strangewiches, in a bowl, mix sliced strawberries, balsamic glaze and sugar. Let stand 15 minutes. 2 In another bowl, mix Hellmann's® or Best Foods® Real Mayonnaise with chocolate spread. 3 Preheat cast iron griddle or skillet. Melt butter in griddle and carefully cook each slice of pound cake until golden brown on both sides. Set aside. 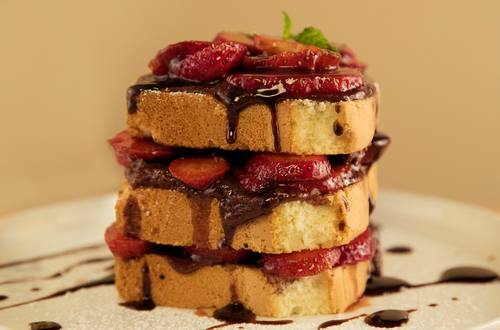 4 Stackin’ time: Spread each slice toasted pound cake with chocolate Mayonnaise. To create the tower, top 1 slice with strawberries, followed by 2 more slices each topped with strawberries. Repeat for remaining sandwiches. 5 For Garnish, mix balsamic glaze and chocolate spread. Drizzle on top of warm sandwiches. Garnish with mint and enjoy!